The Heartland Poker Tour (HPT) The Meadows $1,100 Main Event finally came to an end with Dan Wagner winning the title. 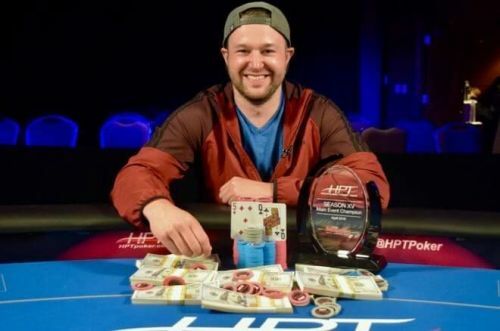 This win is his first-ever HPT title and sixth overall tournament win. There were a total of 345 entries that generated a prize pool of $334,650. And, Wagner took down the event for $76,165 along with a $3,500 HPT Championship package. The money bubble closed at top 36 players, and it included names like Henry Zou (26th for $2,980), Vince Palma (20th for $2,980), Jack Kerr (14th for $4,735), Brian Patterson (12th for $6,292) and Griffin Abel (11th for $6,292). In the end, the final table closed with nine players on it. The first one to exit the table was George Stathers taken out by Anthony McIe in ninth place. He was followed by Kelly Becker who was taken out by Jason Pickup. After this, the table went quiet for some time, and the seven-handed play ran for a stretch. During this time Lydia Waltonbaugh showed some brilliant hands taking her chip stacks to a higher number, and Wagner sank to the bottom of the barrel. Waltonbaugh then ran her havoc and removed Christopher Lee and Marcus Gaunt in quick succession at seventh and sixth place respectively. After that towards the end of level 29, Anthony McIe eliminated Andy Spears at fifth place. All this while Wagner was getting his momentum back then he took down Pickup at number four keeping him alive in the game. The game then moved to a three-handed play where Waltonbaugh moved all in against McIe but was eliminated ending her brilliant run on the table in third place. The game then advanced to the heads-up round between Anthony McIe and Dan Wagner where Wagner kept chipping up and finally won the title.